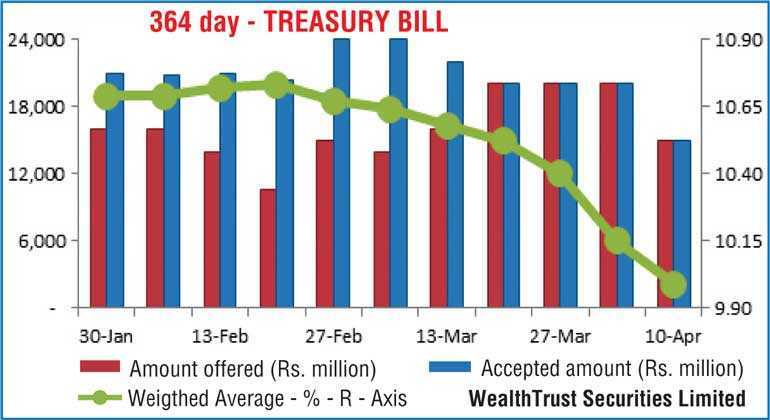 The 364 day bill weighted average was seen breaking and going below the psychological level of 10.00% for the first time since 26 September 2018 to record 9.99% at its weekly auction conducted yesterday. 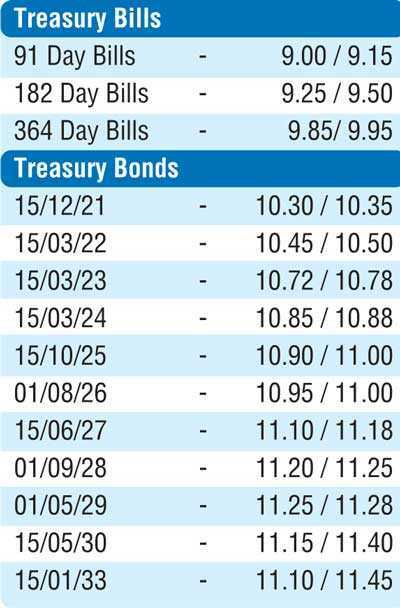 The drop of 16 basis points on the 364 day bill was followed by dips of 15 and 21 basis points on the 91 day and 364 day bills respectively to 9.09% and 9.29%. The exact total offered amount of Rs. 25.00 billion was met at the auction with the total bids to total offer ratio increasing to 3.14: 1. In the secondary bond market, yields were seen dipping yesterday across the curve on the back of renewed buying interest. The two 2021’s (i.e. 01.03.21, 15.12.21) and 15.03.24 saw volumes change hands within the range of 10.20% to 10.36%, 10.25% to 10.50% and 10.85% to 10.92% respectively. In addition, the maturities of 01.05.19, 01.05.20, two 2021’s (i.e. 01.05.21 and 01.08.21), 15.03.22, 15.03.23, 01.06.26, 15.01.27 and 01.05.29 were traded at levels of 9.20% to 9.25%, 10.12%, 10.25% to 10.50%, 10.30% to 10.38%, 10.50%, 10.77%, 11.05% to 11.10%, 11.07% to 11.08% and 11.26% to 11.30% respectively as well. The total secondary market Treasury bond/bill transacted volumes for 9 April was Rs. 10.79 billion. In the money market, the OMO Department of the Central Bank injected liquidity by way of an overnight and seven day repo auction, for amounts of Rs. 5.00 billion and Rs. 2.40 billion respectively, at weighted averages of 8.51% and 8.53%, as the net liquidity shortfall in the system stood at Rs. 7.55 billion. The OMO Department also infused a further amount of Rs. 4.50 billion by way of a 14 day term repo auction at a weighted average rate of 8.55%, valued today. The call money and repo rates averaged 8.51% and 8.54% respectively. Meanwhile in Forex markets, the USD/LKR rate on spot contracts appreciated marginally yesterday to close the day at Rs. 174.60/70 against its previous day’s closing level of Rs. 174.70/85 on the back of inward remittances outweighing import demand. The total USD/LKR traded volume for 9 April was $ 103.36 million. Some forward USD/LKR rates that prevailed in the market were: 1 month - 175.60/80; 3 months - 177.40/60; 6 months - 180.30/50.